Does GoDaddy Hosting Offer WordPress Hosting Specifically? Migrating a Site To hosting provider and Transferable Installs: How Easy Is It? GoDaddy Control Panel (Cpanel): Do They Offer One To Manage Your Hosting? Does GoDaddy Offer Shared Hosting and Dedicated Servers? Does GoDaddy Offer Email Hosting? Pricing, Packages & Plans for GoDaddy- Money Back Guarantee. 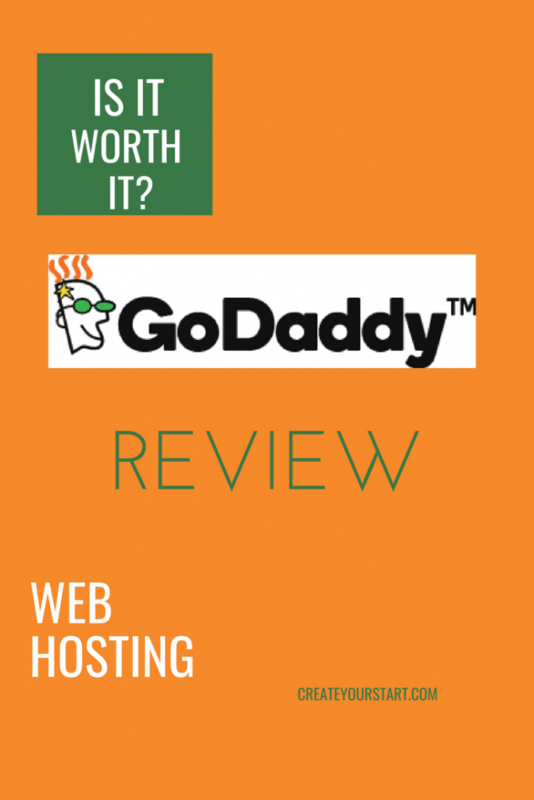 Does GoDaddy Have a Satisfaction or Money-Back Guarantee? GoDaddy Phone Number: Do You Get a Real Person? 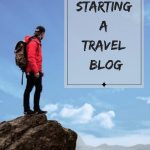 When I started blogging, one of the things that I had to choose was one of the many hosting plans. For the newbie blogger that I was, I actually thought that once I bought one, that will be it. Boy, was I wrong. I wasn’t sure about what to look for in purchasing a hosting plan, so I started researching and reading reviews. I was not given hard facts to back up the reviews, so I decided to do the digging on my own. I looked into hosting plans, customer support, web hosting services, domain registrar, ssl certification, and more. 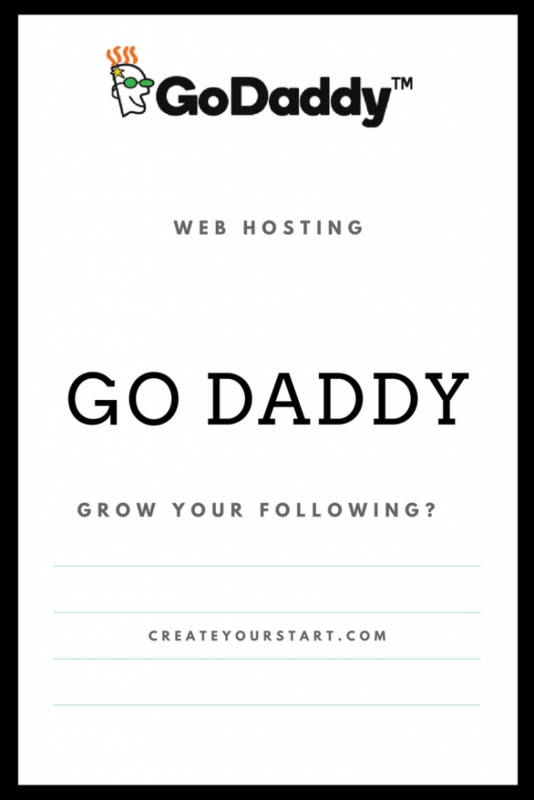 In this post, I am going to share with you the hard facts about GoDaddy hosting plan. We’ll analyze both the Pros and Cons so that you can make an informed decision. You’ll find some techy jargon, but don’t worry; I’ll break it down, so it’s easy to understand. They are a Web hosting and domain registration company founded in the ’90s by Bob Parsons. It prides itself as a company that seeks to give small business the keys to drive in a Global economy. GoDaddy being in operation for more than 20 years is one of the largest web hosting companies there is with about 6000 employees and 17M customers worldwide. It has a strong brand name hence it’s among the most popular web hosting companies. Due to its strong brand presence and its history, people tend to trust them and often make them the first choice when it comes to buying domain names and web hosting. In this GoDaddy review, we will explore what makes them unique, why people prefer to use them and also what people are saying about this company. 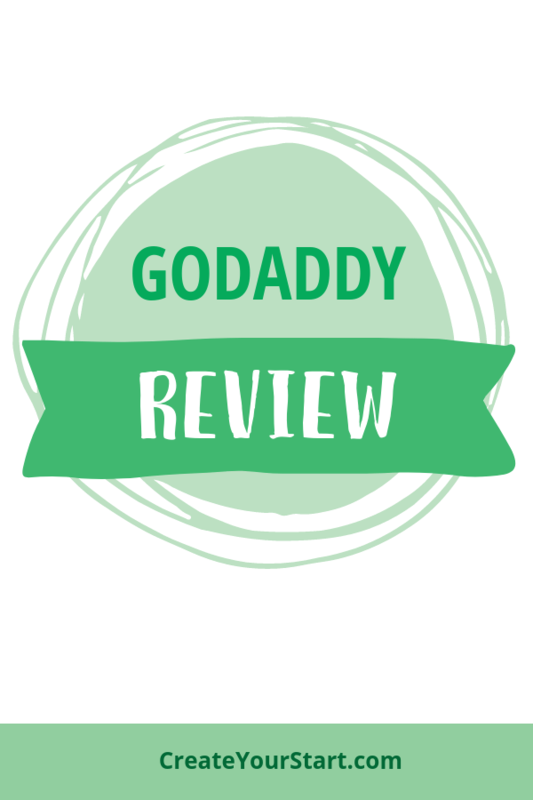 GoDaddy is great with a rating of 4.7/5.0, so we will give the go-ahead for anyone who loves the stability and speed which it offers its customers. 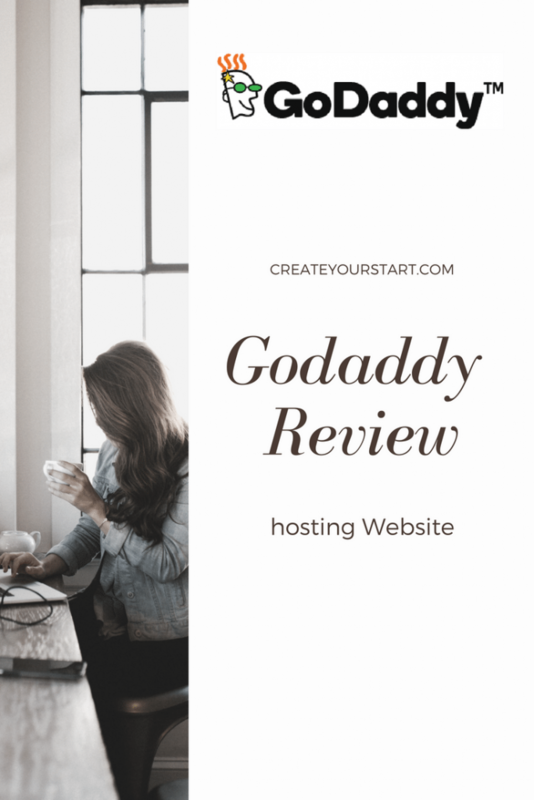 Before I dive into the GoDaddy review, I would like to explain what a Hosting plan is, in case you have no idea of what I am talking about. 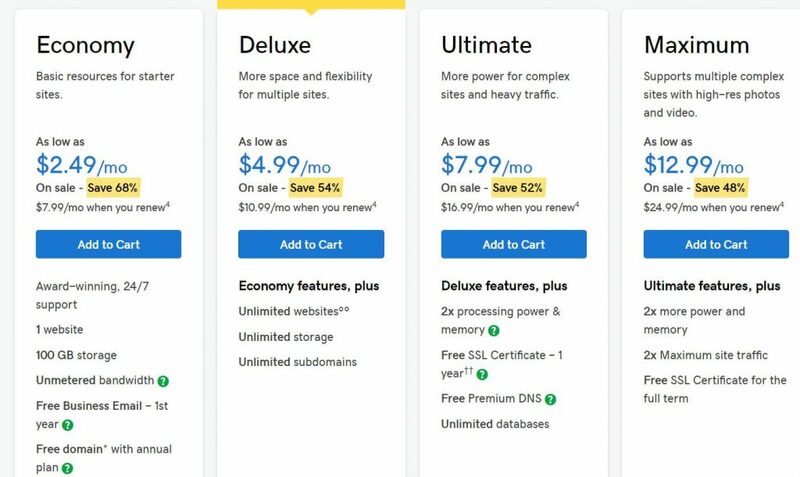 Think of a hosting plan as a rent you pay to your online landlord (In this case GoDaddy) in other to give you a space to build your site. Hosting provides you a domain name. The domain name registration is like choosing and registering your business name. It’s exactly the same process you’d do in person, but online. 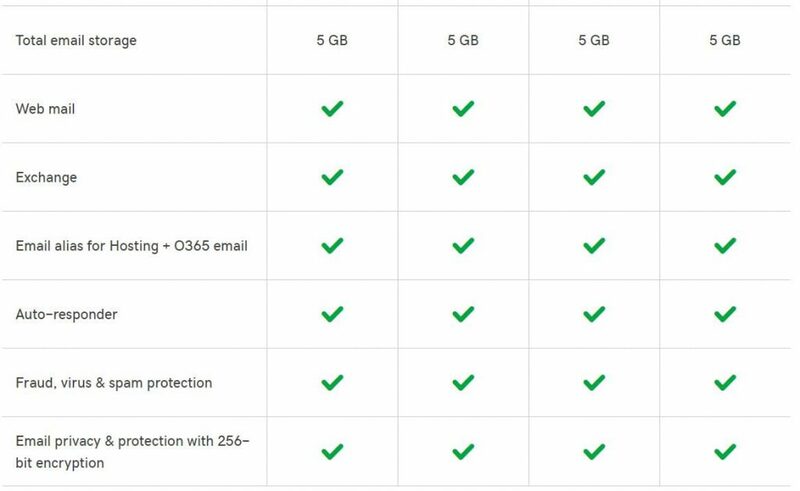 With this info cleared up, let us get into the Pros of GoDaddy Hosting plan. 1. Offers high speed and excellent load time. It’s the top editors’ choice when it comes to blogging. 10. You get a lot of ancillary services with their plans. 7. They do not offer free backups for your site except you buy the WordPress managed hosting option. Most people consider GoDaddy to be a great option for a newbie user. Like most good things, there is often some bad news. I’ll show you below some bad things people are saying. GoDaddy has an excellent and easy to follow website set up and development. Even if you just want to buy your domain and hand it over to someone to build for you, you’ll get an excellent recommendation for great website builders at a good price. If you want to do it yourself, they also have an easy drag and drop website builder option. You really can’t talk about anything website-related these days without hearing about WordPress. I mean, it’s like trying to make chicken soup without chicken, so it’s not at all surprising that Godaddy decided to cash in on it. GoDaddy offers a WordPress hosting in another package; It has a simple pre-built drag and drop features for this package. The service handles your backups and software updates for you. Throw in a free domain and e-mail service and you are practically ready to start your site. The WordPress hosting plan is optimized for speed with a load balancer servers that help your site adjust for sudden spikes in traffic. A feature you will need as a blogger if your PIN goes viral and you have a sudden traffic spike. This package is a little higher in price though. see below the packages available. Yes, free domain is available on all plans but with a precondition that you purchase an annual plan from them so that you are locked in for a year. A DNS (Domain name system) is what links a name, or a domain typed in a browser to a set of numbers which computers understand. It translates our English words into a set of numbers so that the server can look it up and serve it to the user. It’s kind of like looking up a number from a directory, so when you type someone’s domain name, it will look it up to see if its available in its servers memory so as to serve you what you are looking for. It looks pretty simple, but it’s actually complicated. In short, your DNS works with the Nameservers to direct people who type your domain name in their browsers to serve them with the information they require. 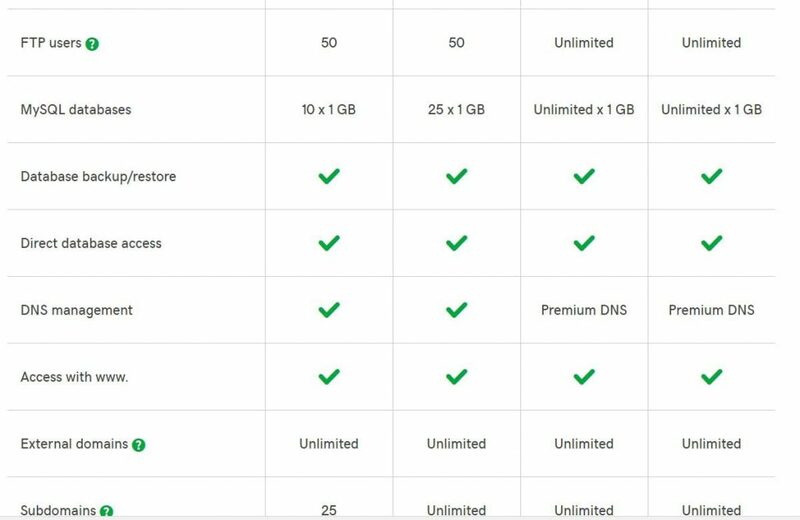 Godaddy offers managed DNS services on all their plans. They offer migration of site to their own site with a one-click install button especially if you are using the WordPress hosting service. cPanel is like a Control station which you use to manage your hosting service. It’s on the cPanel that you get to see the different options you have for building your website. You get to see a variety of content management system such as Joomla, WordPress, Magento, Drupal, etc. 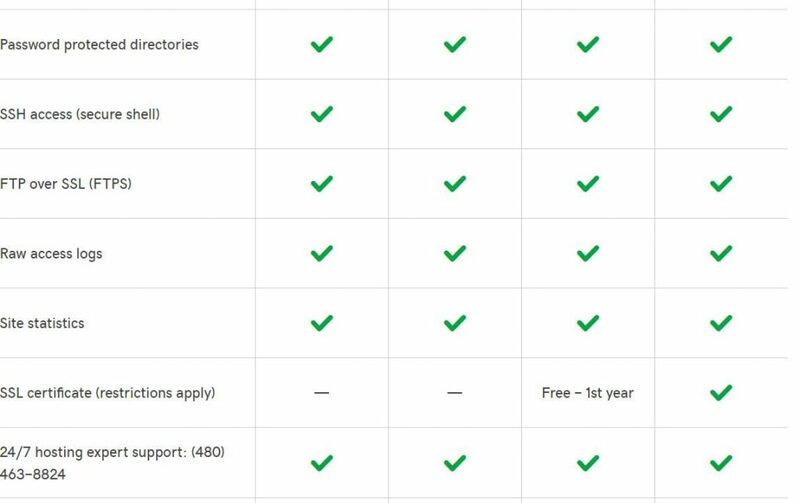 GoDaddy offers about 125 one click, free installation apps on their cPanel. These 125 free apps include the above-mentioned content management systems(CMS) and also e-commerce integration apps such as woocommerce. A content management system is a preset set of codes already written for you to just use to get your website going. Think of a content management system like a pre-built house, where you get to finish up by furnishing it and putting in other things which you love like painting, pictures etc. WordPress is super popular because you add other kinds of stuff which help you to run the website with what is called a plugin. You also get the access to set up your email accounts from your cPanel. Don’t be like me; It took me 6 months to figure out where my email login credentials were located. In the cPanel, you can also find where all the files that are uploaded on your website are located. If you’re ever unable to log into your site, this is where you go to unlock it. FTP and SFTP are like a transport system you use to upload your files to your website. 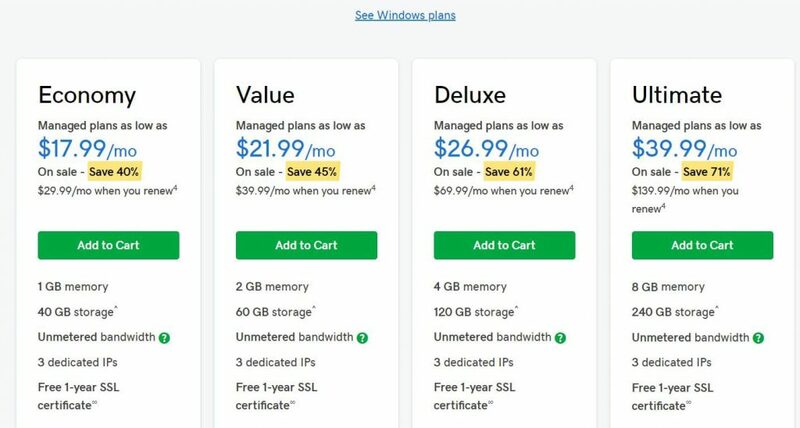 GoDaddy offers this option to anyone who wants to upload an already built website to its own servers or transfer their website to their own hosting plan. They offer 24-hour support (including a live chat) if you run into problems. Godaddy now offers a simple do-it-yourself site build option with their Gocentral features. You can build the site using all the features they have available including the different templates they have for different types of websites. To check this out, click here. They support all level of PHP versions and even offer you a guide on how to upgrade your PHP version where need be. GoDaddy now supports the latest version of PHP which is version 7.2. GoDaddy offers support for Git and also command line integrations through its cPanel. 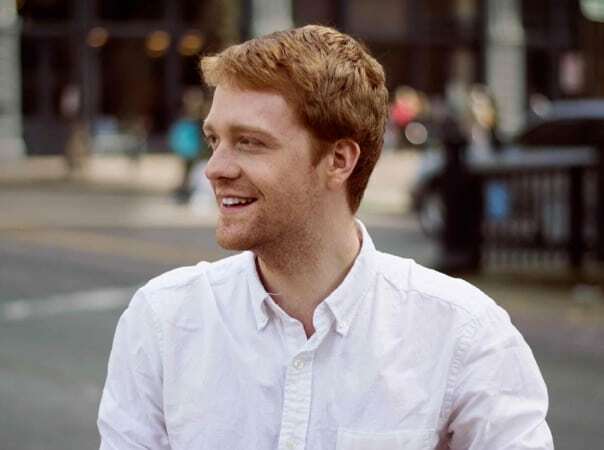 They offer an SSH connection with their WordPress hosted plans. Speed is essential if you are online because when your site is slow to use, people get turned off and never come back. The speed of your website has to do with how fast your website shows the information which the user is requesting to see. Your website speed is often a function of 2 things: Your web host service provider or the Network which the user is using. If the user is quite sure it’s not the network that is the issue, then its often a reason for them to leave your website. The average time that a website user expects a website to load is 3 seconds. 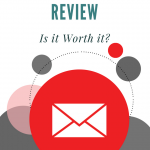 If it exceeds that, studies show that 79% of customers are less likely to return. This is even more so when its a mobile device they are using, so speed is an essential quality of having a good website. 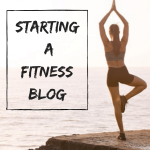 Godaddy is a big company and has everything that you need to start your blogging journey. If you check through their packages, you’ll get a lot of ancillary services depending on the package you are buying. They have categories of plans which are based on, either the Linux server or the Windows servers. While both of them are good, a Linux based server is better because it offers security and stability. The plans have different services attached. I’ve mentioned most of them above. You can take a look at the picture below to see what services come with what package. A major key issue which anyone who wants to buy a hosting plan must consider is the uptime. You want to buy from a provider who has a very good reputation for having very sparse down times. This is where Godaddy has a great advantage over other providers because it has a very robust system its average uptime is up to 99.9%. We took a look at some tests conducted and here is the result for the past 9 months. This is performed by collecting information from the nearest geographic server from you hence enabling your website to load faster. Godaddy doesn’t offer CDN directly, but depending on the package you want to buy they will offer yo the ability to integrate with a third party provider KeyCDN. 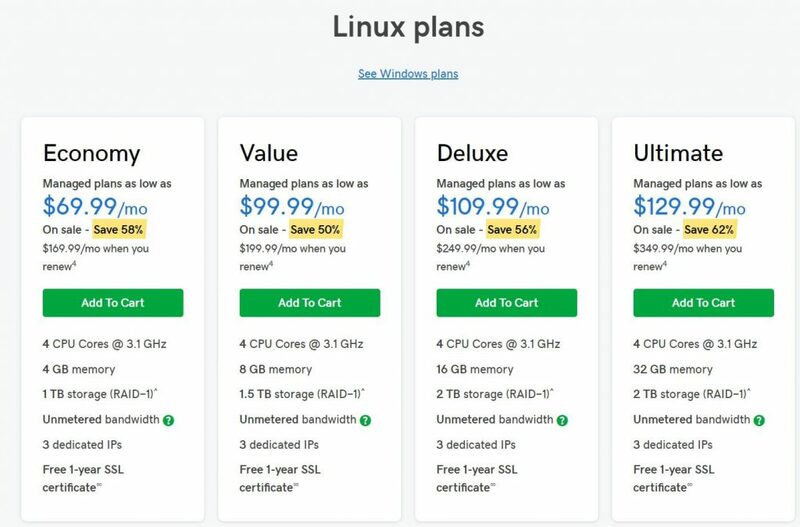 The shared hosting service is the plan where you get the cheapest of your hosting which stands at 2.49/month, as you get to the VPS your cost of hosting increases of course with more features. The dedicated server is the most expensive for obvious reasons it is usually used by big businesses. GoDaddy does not offer free SSL (Site security Lock). SSL is a requirement from Google in other not tag your website as not secure thereby driving your users away. This may not be a serious problem if you really want to use GoDaddy, because you can opt to get the free SSL from here. The only snag is that it expires every 3 months, so you have to renew it yourself. You’ll also have to know how to use your cPanel in other to be able to do this. You can contact the customer service to help you install it once you have generated the certificate signing request (CSR). The low-cost package is highly basic if you want any other extras like the SSL above you will have to pay more. 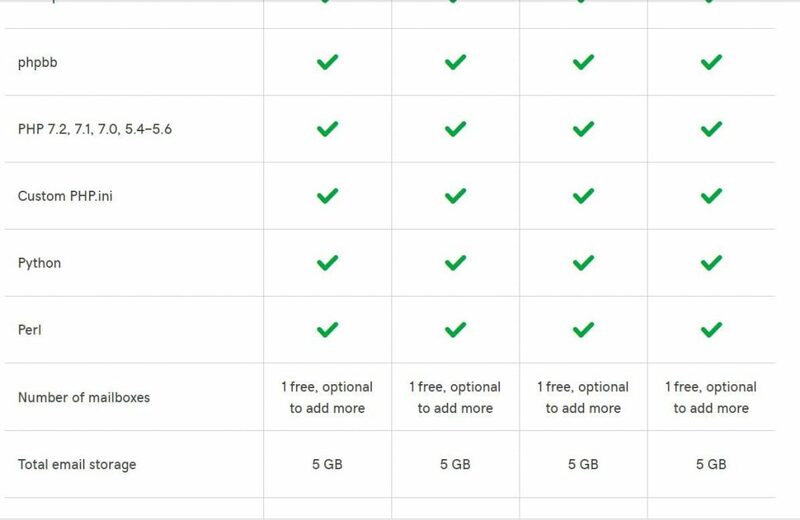 Godaddy doesn’t offer free back up for your website. 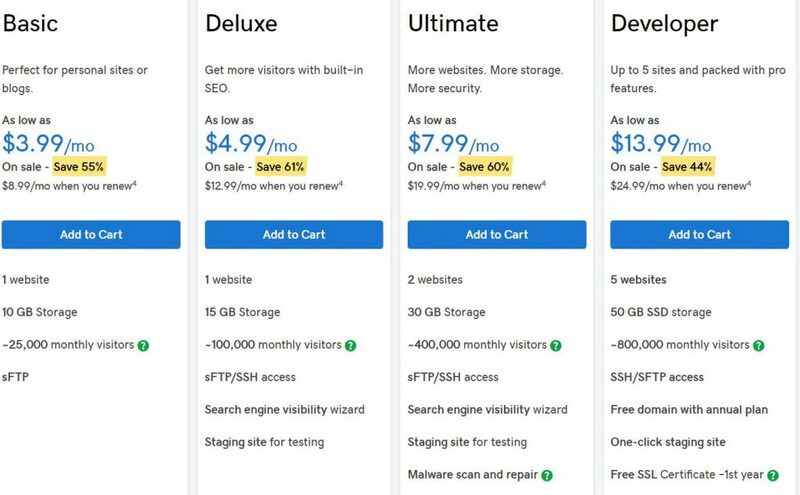 You have to pay a monthly fee of 1.99/month to get it; however, if you buy the WordPress managed hosting plan, you will get it for free. The backup service is very easy to set u. It’s automatic once you connect your domain name to your website. To learn how to set your back up, click here. Redirects are when you need to point your page links to somewhere where the information the person who is enquiring for it, is located. It can be used to point a link which will have given you an error message to another page with the information required. I have had my fair share of broken links which lead to error pages. Therefore it’s something I will like to look at if I am buying a hosting plan. For this GoDaddy review, I made sure to find out. To find out how to create a redirect for your pages, read this article. Godaddy supports both multisite and subdomains. The only snag is that it’s not all plans. For example, on the economy plan using the shared hosting platform, you will not get a multisite option, you only get a subdomain option. 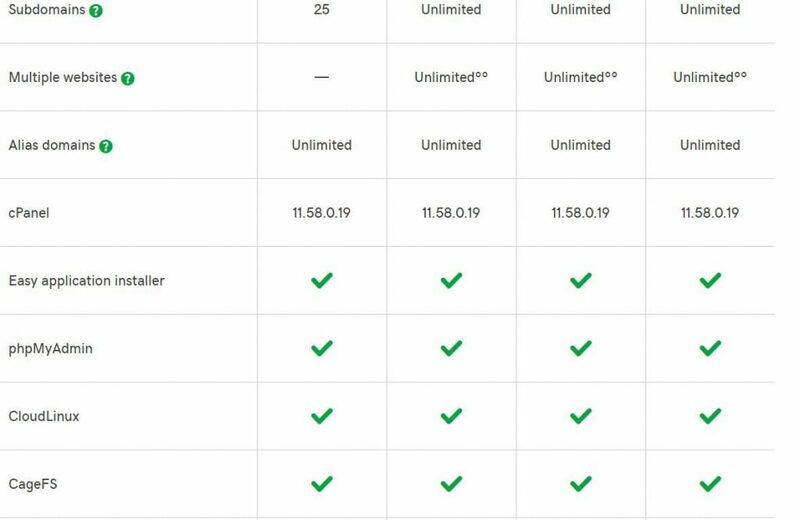 Other categories of the shared hosting plan starting from deluxe to maximum plan gets unlimited subdomains and multisite. Multisite is your ability to create multiple sites on one hosting plan. For example, you may want to create different sites to cater to a variety of ideas which you have. 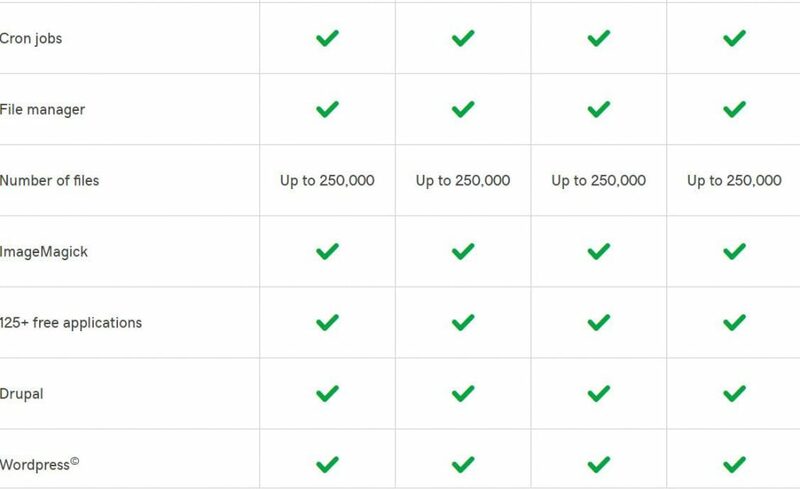 Godaddy offers only one free email hosting for the package you buy on the shared hosting plan if you need more email accounts hosting you will have to pay for the extras. GoDaddy does not offer Cloud hosting to its customers, it once did but shut it down in 2017. The Godaddy Review won’t be complete without talking about hacking, (the thought of it sends shivers down anyone’s spine). It will be like building a beautiful house without putting any security measures in. 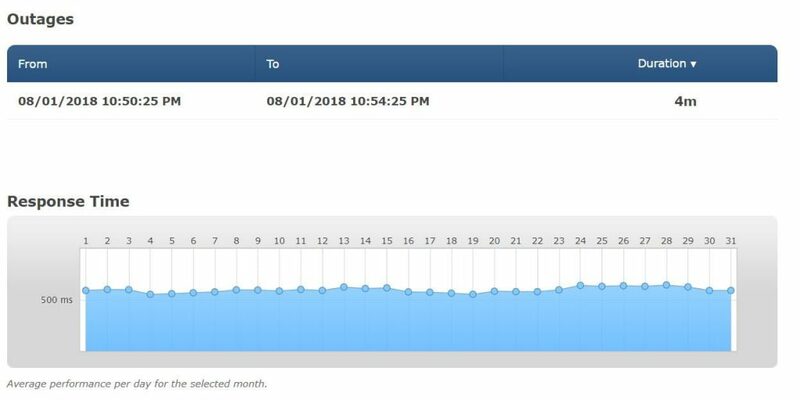 Like many other hosting companies, GoDaddy is not immune to hacking; it is a general problem for everyone who is online. The best thing you should look out for as a newbie blogger is if your hosting company has an immediate response to you should you get hacked. You should also consider the options open to you even before you ever get hacked. 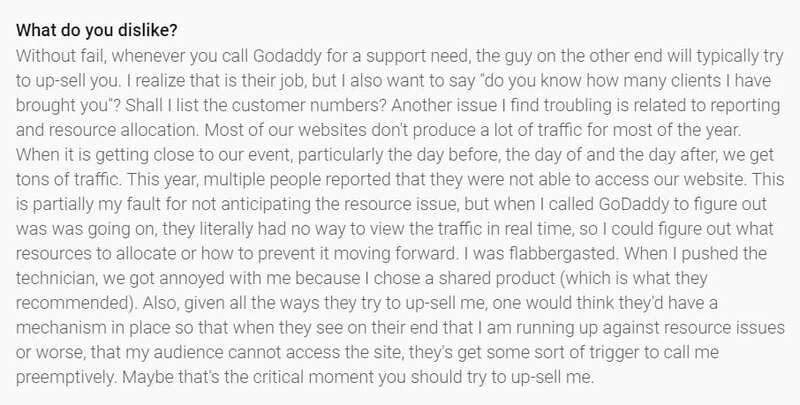 For example, Godaddy offers an upsell (I know no one like that but what’s the point of building a site without security) from a third party security provider called Sucuri. I have used them before and found them helpful. If you are using WordPress managed option, there are free plugins you can use for protecting your website. One such option is Wordfence, a certain aspect of their package is free, another one is Loginizer. Also, ensure that your passwords are strong, I will advise you use a password generator instead of coming up with one your self. Finally, ensure that you do not leave any idle plugins on your website( this is specific to WordPress) as they could become a backdoor for hackers to access your site. With these measures in place, your site should be fine. The Pricing packages as mentioned before is mainly according to the type of plan you’re buying. 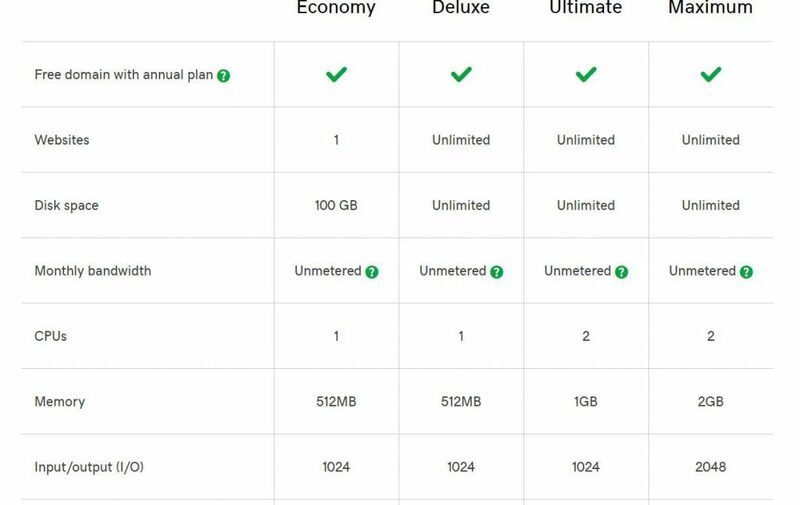 Most Godaddy plans are annual, especially with the low priced option, they do offer monthly subscription too, but they cost more anyway so why go for it. As seen from the pictures from above most of their plans have the unmetered bandwidth. If for any reason you are exceeding your resource use for a month, you will be alerted for an upgrade. They make provisions for sudden spikes in traffic which is not continued. Should it be continued, you will have to upgrade. So while it’s called unmetered bandwidth, it comes with some level of control and monitoring. Their policy states that if you wish to cancel and have your refund, it must be within 30 days of purchase, however, there are exceptions to that policy. You will also need to contact their live chat support to initiate the cancellation, especially where there was an autorenewal on the payment platform, to read more about this issue, click here. They do provide a 30-day money back guarantee should you change your mind. However, I find that 30 days is usually not enough for one to test a service to know if you will change your mind. Their customer service is amazing. You’ll always get someone who is knowledgeable and can provide the resources to help you, should you run into a problem. Godaddy provides a phone number with which you can reach a customer service agent online; you will also find that you will get to talk to a real person that speaks good English, They are usually quite knowledgeable and know what they are doing. To get started with Godaddy hosting click here.